An Osteochondral fracture is a tear of the cartilage which covers the end of a bone, within a joint. It is also known as Osteochondritis Dissecans and is common in the knee joint, especially in association with other injuries such as ACL tears. The athlete will feel immediate pain at the time of injury with rapid swelling. The pain will get worse on weight bearing and the knee joint may lock or feel unstable. If an osteochondral fracture is suspected then an X-ray may be undertaken to confirm the diagnosis. Fragments are not always clear on an X-ray and so an MRI or CT scan may be used instead. Osteochondral Fractures are also sometimes known as articular cartilage injuries. The only difference is that with an osteochondral fracture, there may also be a bone fracture involved. Sometimes the torn piece of cartilage also contains a bone fragment. These fragments can vary is size and depth, with larger ones typically causing more problems. These fragments are sometimes known as ‘loose bodies or fragments’ and can cause symptoms such as those listed above, which may be intermittent as the fragment moves within the joint. 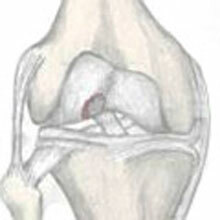 The knee may go for long periods with no symptoms at all, only to then play up for a few days at a time. Osteochondral fractures occur most frequently in children and adolescents as the bone is softer and so more likely to fracture in this way. This injury most frequently occurs during a violent twist to the knee, especially when weight bearing. The twist may occur from direct trauma such as a tackle or other impact, or from a fall. As with similar ankle injuries, an osteochondral fracture is graded 1 to 5 depending on severity or type of injury. Treatment depends on the severity of the injury. Grade I and II injuries are treated with physical therapy and rehabilitation. The wearing of a cast to immobilize the joint has previously been used, although this is not as common now. More severe injuries (grades III and IV) usually require arthroscopic (keyhole) surgery to remove or repair the damaged fragment. A full rehabilitation programme should follow to regain full strength, mobility, and balance.